Origin and Habitat: Ferocactus latispinus var. greenwoodii it is only found between Oaxaca city and Tehuantepec in the valleys of Totolapan and Nejapa. Habitat: It is common in dryer areas and grassland. It may also occur on rocky hillsides. Echinocactus cornigerus var. latispinus C.F.Först. Echinocactus latispinus (Haw.) hort. ex C.F.Först. Cactus cornigerus Moc. & Sessé ex DC. Echinocactus cornigerus var. flavispinus Haage ex C.F.Först. Ferocactus latispinus var. flavispinus f. cristatus hort. Cactus multangularis Voigt ex Steud. Echinocactus spiralis Karw. ex Pfeiff. Echinocactus stellatus Scheidw. non Speg. 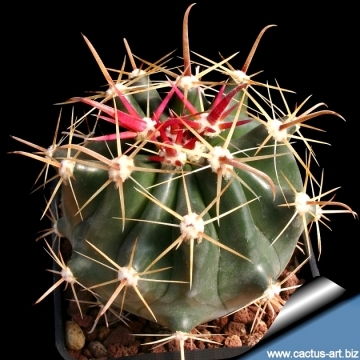 Description: Ball-shaped or flat-topped barrel cactus. Stem: Flattened to spherical (in cultivation), diameter up to 16 cm, 10 cm tall. Ribs: ± 13, sharp areoles, large with grey to blackish felt. Radial spines: 4-5, translucent, cream-yellow up to 2,5 cm long, straight spreading out the central spines, they have almost no width at all. Central spines: 1, thick apically bent downward, amber-coloured to grey-red (bright red when very young), up to 4cm long. Flowers: Beautiful “glassy” straw-yellow, up to 6 cm long and 3 cm broad. Blooming time: Late autumn to early winter but usually only if the weather is warm and sunny ( need a fair amount of bright sunlight to form) This species blooms very early, many young plants will bloom when they reach 10 cm in diameter. Ferocactus cornigerus (DC. 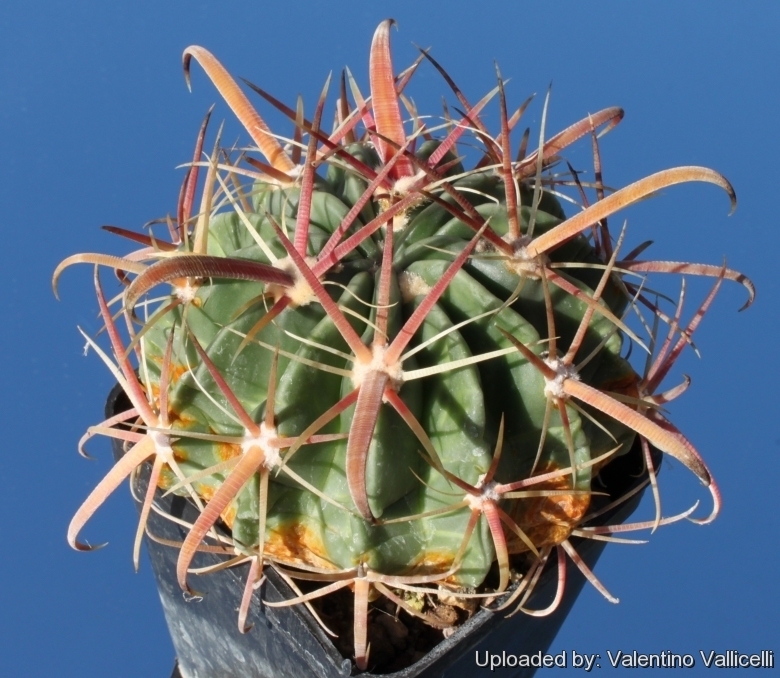 ): Ferocactus corniger and Ferocactus latispinus are synonyms although the wide variety of features in the same species makes it possible to find plants with certain superficial dissimilarities. Ferocactus latispinus var. flavispinus (Haage ex C.F.Först.) Backeb. & F.M.Knuth: The plants are identical in shape to the standard species but the spines are all yellow. Ferocactus latispinus var. flavispinus f. cristatus hort. 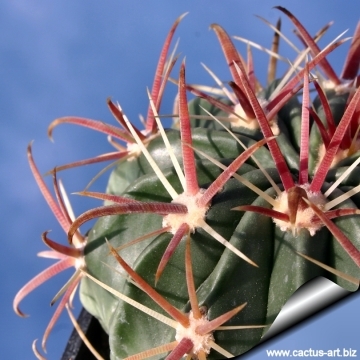 : It is a strong crested cactus with yellow spines. Ferocactus latispinus var. greenwoodii (Glass) N.P.Taylor: has ball-shaped or flat-topped stems, with less curved to nearly terete central spines and only 4-5 radial spines. Distribution: between Oaxaca city and Tehuantepec in the valleys of Totolapan and Nejapa. Ferocactus latispinus subs. spiralis (Karw. ex Pfeiff.) N.P.Taylor: has pherical to elongate stems occasionally up to 1 metre tall and 5 to 7 stout radial spines. Distribution: endemic to southern Puebla and southern Oaxaca. 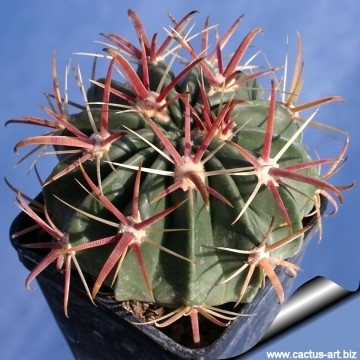 Ferocactus recurvus (Mill.) Borg: (is a rejected name for Ferocactus latispinus var. spiralis) has pale pink flowers, with a deep almost maroon-pink throat. Uses: The "Candy cactus" is used to make sweets. The middle is cored out and soaked in sugar, then chopped up and eaten. Warning: The spines that hook around can graph you if you get too close.